Dr. Camille Newton of Bonsall, CA, texted me immediately after the Lilac Fire to say that eight homes on her street had been destroyed, yet hers was unharmed. “Succulents saved the day,” she said. Such reports aren’t unprecedented. 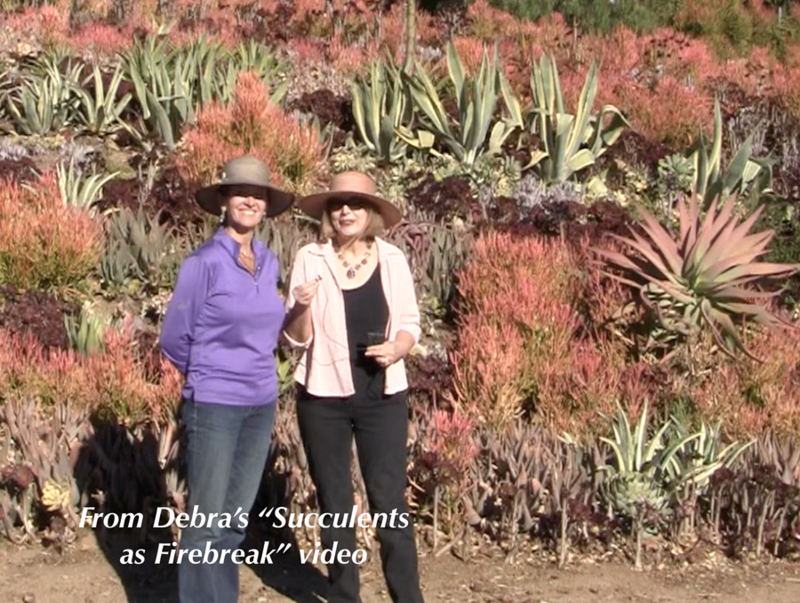 Suzy Schaefer’s succulent garden in Rancho Santa Fe “saved our home,” she told me (and national media) after the Witch Creek Fire. I knew of others as well. Even so, I was skeptical. True, succulents tend to cook rather than burn and don’t transmit flames. But wildfire is so intense it melts metal and glass. What chance does any plant have? Moreover, wildfires are wind-driven. A barricade of fleshy plants might halt a slow fire, but what about flying, flaming embers? And isn’t it possible that what appears to be salvation-by-succulents is merely the capricious way wildfire skips houses? You already know that I’m a big champion of succulents, but what you may not know is I’m also a journalist. I’m aware of how emotion and wishful thinking can cloud a reporter’s judgment. Yet what I saw when I went to Camille’s truly amazed me. 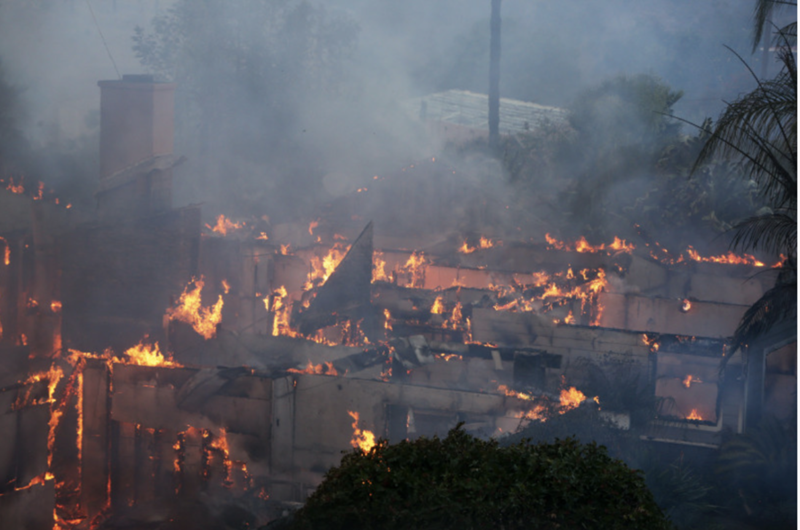 Above: News photo of the house next door to Camille’s during last week’s Lilac Fire in Bonsall, CA. Below: After the fire. 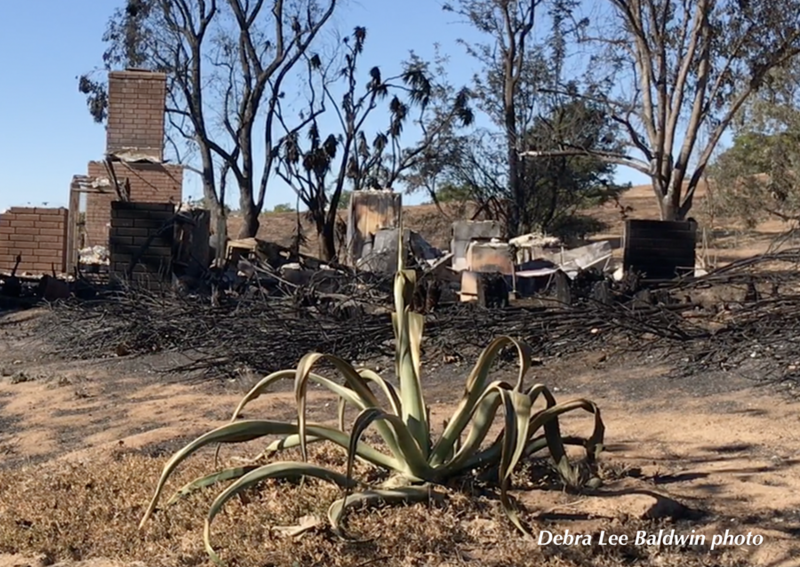 Next door, where a home had been reduced to ash and charred appliances, the only green left in the yard was an Agave vilmoriniana with singed leaves. Along the driveway were a former fence of cylindrical wooden posts that had burned into the ground, and black sticks—former ornamental shrubs—flattened by fire and wind. So, what IS it about succulents that make them…dare I say it…fireproof? What I can say with certainty is that planting a swath of moisture-rich, fleshy-leaved plants is smart if you live in a mild, arid region plagued by drought and wildfire. Readily available agaves, aeoniums, elephant’s food, aloes, jade, and ironically-named ‘Sticks on Fire’ propagate easily from pups and cuttings, are low-water and low-maintenance, and when combined, create a gorgeous garden. If it also serves as a firebreak, well—as I told a KFMB-TV reporter—that’s icing on the cake. 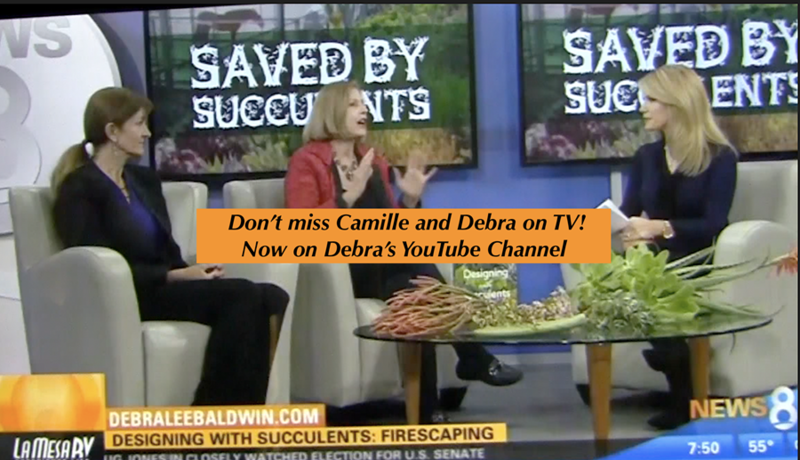 Above: Camille and I talked about firescaping with succulents on CBS. Five days after the Lilac Fire ripped through her neighborhood, I visited Camille and documented her story with my camera and camcorder. Of all the videos I’ve made (my YouTube channel now has 200+ with over 3,000,000 views) this one is, IMHO, by far the most interesting and important. I urge you to watch my two videos in which Camille shares her story and garden. Even if you don’t live with the threat of wildfire or where succulents can grow outdoors year-round, I promise you’ll be entertained, fascinated…and, like me, amazed.